Cold air to -50°F (-46°C) from your compressed air supply -- with no moving parts! 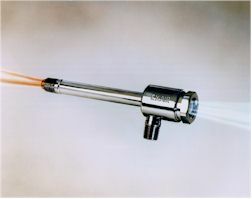 Compressed air, normally 80-100 PSlG (5.5 - 6.9 BAR), is ejected tangentially through a generator into the vortex spin chamber. At up to 1,000,000 RPM, this air stream revolves toward the hot end where some escapes through the control valve. The remaining air, still spinning, is forced back through the center of this outer vortex. The inner stream gives off kinetic energy in the form of heat to the outer stream and exits the vortex tube as cold air. The outer stream exits the opposite end as hot air. There is a detailed discussion of vortex tube history and theory later in this section. For more details on the theory behind vortex tubes, click here. Cold airflow and temperature are easily controlled by adjusting the slotted valve in the hot air outlet. Opening the valve reduces the cold airflow and the cold air temperature. Closing the valve increases the cold airflow and the cold air temperature. The percentage of air directed to the cold outlet of the vortex tube is called the "cold fraction". In most applications, a cold fraction of 80% produces a combination of cold flow rate and temperature drop that maximizes refrigeration, or Btu/hr. (Kcal/hr.) 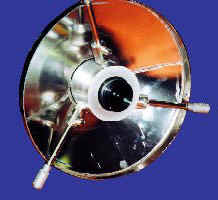 output of a vortex tube. While low cold fractions (less than 50%) produce lowest temperatures, cold airflow rate is sacrificed to achieve them. Most industrial applications, i.e., process cooling, part cooling, chamber cooling, require maximum refrigeration and utilize the 3200 series Vortex Tube. Certain "cryogenic" applications, i.e., cooling lab samples, circuit testing, are best served by the 3400 series Vortex Tube. Setting a vortex tube is easy. Simply insert a thermometer in the cold air exhaust and set the temperature by adjusting the valve at the hot end. Maximum refrigeration (80% cold fraction) is achieved when cold air temperature is 50°F (28°C) below compressed air temperature. 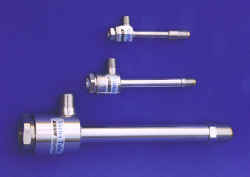 Temperatures, flows and refrigeration are adjustable over a wide range using the control valve on the hot end exhaust. 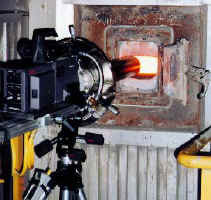 Special high temperature vortex tubes keep a boroscope lens cool while inserted into a 1200°F boiler porthole. 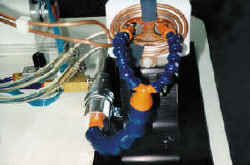 A Model 3215 Vortex Tube cools a die on a medical tube forming machine.